So now that Humanatic has approved your account you're ready to get started with calls. You will have the choice between doing inbound or outbound calls. 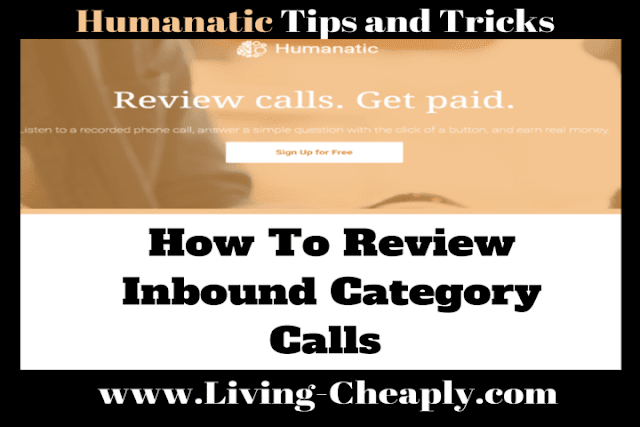 We will mainly focus on tips and tricks for inbound calls. We will address Outbound calls in a later article. First of all, pay for Inbound Calls is $0.012 per call. Obviously your not going to get rich at this rate. Most likely you will be earning less than $2.00 an hour. This is far less than the middle wage in first world nations. Making this task more idea for individuals from 3rd world nations. That said these tasks are very simple. Workers will be listening to calls and determining if a caller managed to get connected to a qualified agent. Or in other words, determine if the caller got a hold of someone that could help assist them with whatever reason they called in for. For example, if someone was called a car dealership and inquired about the price of a car. You will determine if they got a hold of someone that could do so. Humanatic considers these calls connected calls. Caller phones a Chevy dealership in hopes of purchasing a new model Chevy Cruise. As you would expect a receptionist is the first to pick up the call. The receptionist then asks the caller how they can help. The Caller informs the receptionist that they are interested in the new Chevy Cruise models. The receptionist then transfers the caller to the Chevy sales department. Lastly, a salesman from the Chevy sales department answers the call 40 seconds into the call. However, they did not speak to the caller until 41 seconds into the call. Reason: In this situation, the Chevy salesman is a qualified agent. Sometimes people think the caller connected when they told the Chevy receptionist their need. However, the receptionist was not qualified to solve the need of the caller so they were not a qualified agent. It was not until the caller spoke to the salesman 41 seconds in that they were officially connected. Caller calls a dodge dealership inquiring about his car payment. Dodge receptionist answers the call and the caller asks the receptionist why a payment was not showing up. The receptionist then transfers the call to their finance department. The individual that answered the call in the finance department was not able to help the caller. They then transferred the call to the general manager. Finally, the general manager answers the phone at 76 seconds into the call and they were able to assist the caller. Reason: Although you would expect the finance agent to be able to help the caller they, however, did not do so. It was not until the general managed answered at 76 seconds in that the caller received help with their need. Not connected is fairly straight forward especially if you already understand what makes them connected. 1. Caller called the wrong number. For example, the caller calls a Chevy dealership but they wanted to order pizza. 2. At any point, the call is dropped while talking to an agent. 3. A Caller only wants to speak to a specific person in a department who isn't available. Even if they leave a message they never actually spoke with them. 4. No one answers and the caller reaches the agent voicemail. Even if they leave a message and let the agent know the need. Regardless this still is considered not connected. 5. The caller does not go further than the bridge greeting. A bridge greeting is where a caller is asked to press a specific number in order to speak to a specific department. For instance press (1) for someone in finance or press (2) for someone in sales. 6. Caller hangs up the phone after being left on hold. Or somehow the call is disconnected while they are on hold or being transferred. Fast forward calls 10 or so seconds in until the caller is speaking to a receptionist. The caller is going to tell them the purpose of the call. This is crucial information you will need in order to tag a call. Also, fast forwarding to the end of the conversation can save you a lot of time. For instance, a call may seem to be moving along but is dropped 50 seconds in. If you hear the end of the call you know not to waste your time with the rest. Lastly, if you live in a first world nation you are not going to earning anything close to a living wage doing this. However, if for instance you are maybe bored at work and have nothing better to do. This may be a neat way to make a little extra money. Let us know in the comments below if you have any additional tips or tricks for reviewing inbound calls.